170-year old bridge to be demolished during festive period. 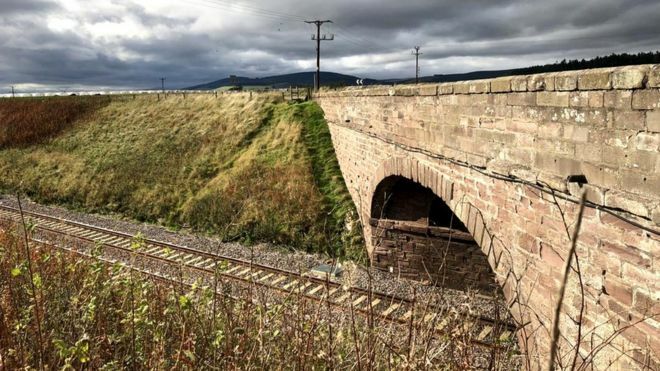 At least one demolition crew will miss out on the Christmas turkey, Queen’s speech and another re-run of The Sound of Music this year as a frail 170-year-old bridge that poses a threat to services on the East Coast Main Line in Aberdeenshire is to be demolished in a £1 million operation starting on Christmas Day. The deteriorating Abbeyton Bridge, on the B966 just north of Fordoun, is threatening the region’s railway link with the south, with the potential for it to collapse onto the rails below. No vehicular traffic has been allowed on the bridge since July, when inspections found serious failings in the structure. Specialist contractor Amco Giffen has been brought in by Aberdeenshire Council and will work alongside council engineers to dismantle the bridge, starting at 10pm on Christmas Eve – after the last train of the day. The aim is to finish the work during Boxing Day. The cost of the demolition alone is expected to be in the region of £1m, over one third of the council’s £2.8m annual budget for bridges and other structures. As a result, the council has warned that there will be a delay in planned works on other bridges and structures around Aberdeenshire, which may deteriorate further in the interim. Posted: November 23rd, 2018 under Bridge.